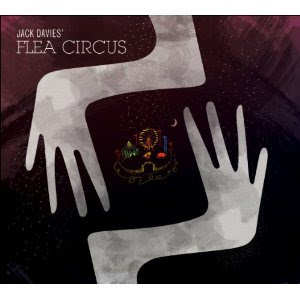 Flea Circus is a quartet led by trumpeter Jack Davies and completed by clarinettist Rob Cope, accordionist Aidan Shepherd and bassist James Opstad. The music on this, the band's first album (all written by Davies except an intriguing version of 'Sehr Gesangvoll', a beautiful melody from Mahler's First Symphony), touches bases ranging from Balkan dance music to bal-musette, and from freely improvised to more straightahead jazz – appropriately enough, given the band's name, a sort of musical circus in miniature – but such eclecticism is by no means merely a bolted-on accessory, rather (as with Davies's great inspiration, Dave Douglas) the spirit infusing everything the quartet plays. The textures available to such an unusual line-up are skilfully exploited by Davies's pieces, and his own trumpet tone, which ranges from the pure, pin-sharp sound often associated with the classical instrument, through to the rips, smears, growls and flaring brilliance of the jazz tradition, sets the standard to which the whole band aspires. The front-line (if such an outfit can be said to possess such a thing) combination of trumpet and clarinet is particularly attractive, and with Shepherd and Opstad carrying out both their solo and accompanying roles with equal aplomb, this is a thoroughly absorbing, thoughtful and lively set from a subtly interactive and accomplished band.